Of all the great pizza rivalries—Patsy vs. Patsy’s, Ray’s vs. Ray’s, Mangieri vs. everyone else—New York vs. New Haven is the one that really counts. The battlefield, littered with bituminous coal and clam shells, moves this week just across the city line to Yonkers, where Coney Island’s Totonno’s has a branch inside the local Ramada, and where the legendary Frank Pepe Pizzeria Napoletana opens its fifth location and the first outside Connecticut. 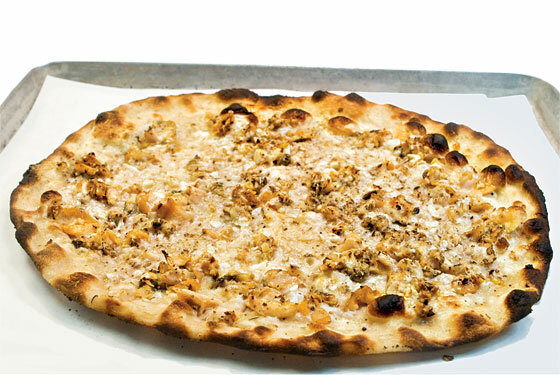 Like previous spinoffs, the newest Pepe’s replicates the flagship’s décor and menu, down to the booths, the coal-fired ovens, and the signature clam pie, Frank Pepe’s toothsome claim to fame (1955 Central Park Ave., nr. Northrop Ave., Yonkers; 914-367-0055).